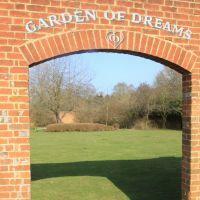 Rotary Club of Guildford District - Welcome! We are a group of men and women of all ages and experiences from Guildford and its surrounding area who, together, use our time, talents and knowledge to try to help Guildford and the wider world be a better place. Rotary is all about Communities. These are local, national and international. Wherever there is a need Rotary is there, whether it is a disaster such as a Tsunami or an awful storm in the Philippines, or an earthquake in Nepal,Rotary will be there in some form to help. Locally we help a large number of Charities and individuals who are in great need. How is this all achieved? Quite often we fundraise.The idea that Rotary is all about collecting in the High Street or outside a supermarket is however far from the truth. We do do this but it is a very small part of our fundraising efforts. 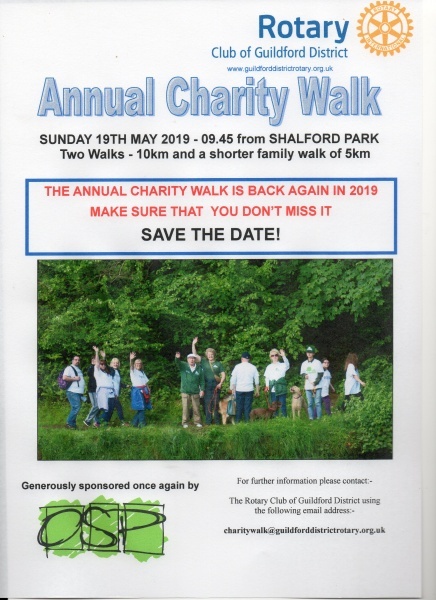 For 26 consecutive years we have run a Charity Walk from Shalford Park where the walkers raise money for their favourite charity at no cost to them. Last years walk took place on Sunday 13th May 2018 and full details and photos can be found by clicking on "Annual Charity Walk" on the "What we do" menu . From the "related pages" on that page you can also download the maps and sponsor forms for this year's event, which is scheduled for Sunday 19th May 2019. Please see the above 'Save the date' flyer, putting the date in your diary. 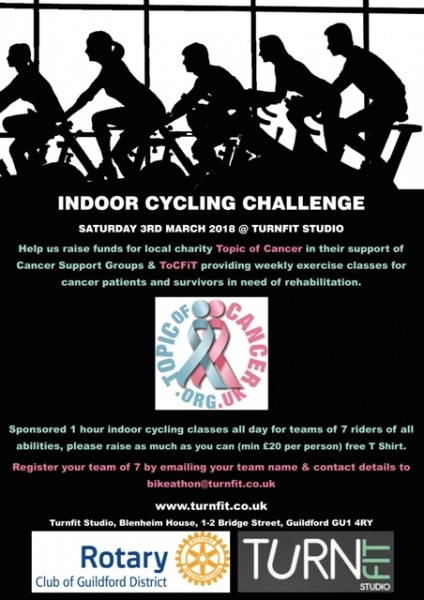 For the last three years we have organised and taken part in a static Bikeathon.Last year's event was on 3rd March 2018 and full pictures and a report are shown on the featured page above which you can access by clicking on "Details", or on the drop down menu "What we Do". We shall be organising another such event this year. Please keep a look out for the date to be announced. 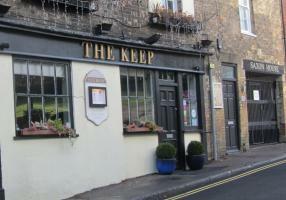 The club has an evening of fun and fellowship annually in September/October when we hold a Fish and Chip evening for club members and their guests. 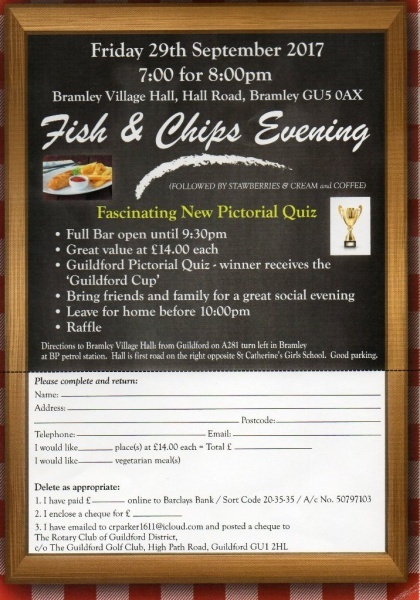 As well as the food there is a competion in the form of a pictorial quiz, and last year the evening, including a raffle, raised over six hundred pounds towards buying a laptop for Challengers following their disastrous fire at their Guildford headquarters. We had agreed that this year the event would be on Friday 12th October but due to the sad passing of the main organiser, Chris Parker, this was cancelled but was brought back as the Rotary Club Christmas Party in December with some excellent entertainment provided by the U3A Ukulele Band. 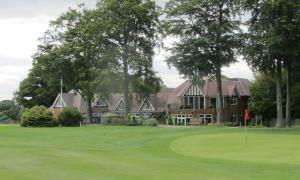 From this event the club was pleased to donate £350 to the band's chosen charity, Shooting Star Chase. On 15th March 2018 we held our 6th Annual Schools Concert at Glive given by children attending schools in the area. 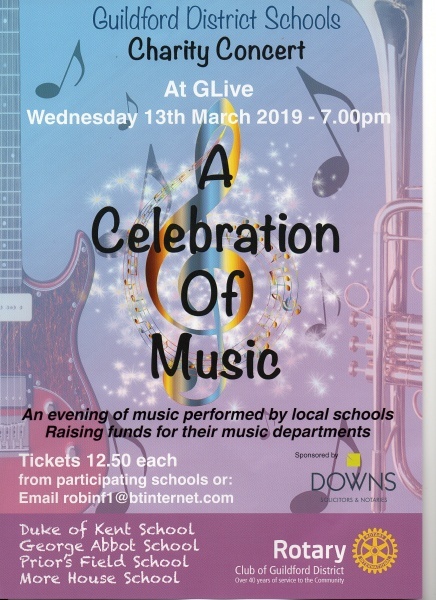 It was another huge success.We have some great young musicians in the area.Please click on "Details" on the featured page above for photographs and a full report on the brilliant concert.